Michael Simmons and Slewfoot, "The Teaser's Waltz"
"Dance with me, dance with me, Devil...."
Yes, it's that time of the year. There's lots of great old baseball footage on the accompanying video. 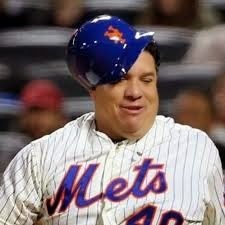 Mets tied for first in NL East! Forty one year old Bartolo Colon (photo) went six innings, striking out eight and giving up three hits, Lucas Duda drove in two runs with a single, the bullpen yielded nothing, and the Mets beat Washington 3-1 at Nationals Park in their season opener. The Nats' starter, Max Scherzer, was impressive, but was undone by errors that allowed the Mets to score all three of their runs unearned. Ironically, Washington was undone by what have been the Mets' bugbears: poor defense and an inability to bring in runners from scoring position. The Mets share the division lead with their erstwhile nemeses, the Braves, who beat the Marlins 2-1. The other Eastern Division team, the Phils, got clobbered in an interleague game with the Red Sox, 8-0 (my wife is smiling; Joe Queenan is gritting his teeth). What does an opening day win portend? Evidently, for the Mets, not much. They hold the best record in the Majors for opening day, 35-19; their seasonal successes have been far fewer. But, as someone (my Tampa homeboy Tony La Russa?) said, "A win in April counts as much as a win in October." Handel: Disserrvateri porte d'averno from La Resurrezione, HMV 147. Doors of Avern [hell], open yourself! And be the dread all melted in flares, in front of the good light of an eternal God! Give way, dreadful doors, give way in front of the King of Glory, whose victory you are the first [to] honour!